You started this. That’s right, back in 2009 when The New Terrarium (Clarkson Potter) came out — you demanded workshops. It began with an inner city public school system inviting me to come and coach their librarians on the fundamentals of terrarium-building. Then those librarians returned to their urban schools and taught the teachers. And the teachers went back to the classrooms and before long their students were making terrariums. And pretty soon, peace and happiness prevailed across the land. At least — that’s the goal. If everyone would make a terrarium, the world will be a less stressful place. If everyone would teach someone else to make a terrarium, we will all be one step closer to universal peace. You laugh. But it’s possible. Right? Anyway, it’s worth a try. Look into a terrarium, and you become part of that miniature world. It soaks up all your stress. Thanks to that little glass-enclosed garden, nature is infused into your hectic day. And terrariums are capable of thriving where most plants are doomed — so they can go into the trenches. Because terrariums prefer low light and require very little maintenance, they’re perfect for the otherwise nature-bereft depths of our hyper-busy lives. 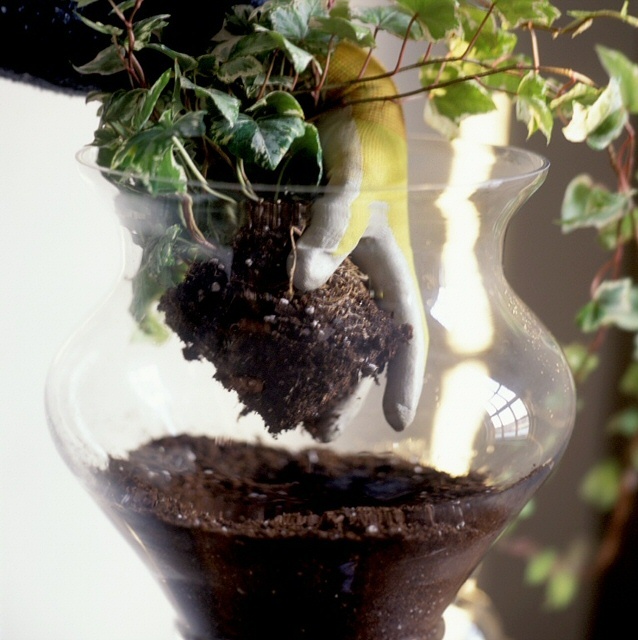 Grow a terrarium in your office cubicle, bring it into the classroom, have it in your home. And every time you walk by your terrarium, give it a glance. See what I mean? Okay, here comes the pep talk: You can do this. Your kid can do this. Your grandmother can do this. Your hamster probably can’t. Why do this? Because this terrarium will rescue your life. You will find peace. The world will be a better place. Nature will seep into all the little nooks and crannies of your existence. Your family will thank you (but I make no promises about the kids ceasing to whine). Creativity will reign. Winter will be bearable. All this from a terrarium. A glass container (okay, you can use plastic, but it won’t sparkle). Preferably find a container that you can fit your hand into. Tuck that baby into the hole, firming it in. Really firm it in. Firm it in again. Talk about fulfilling. 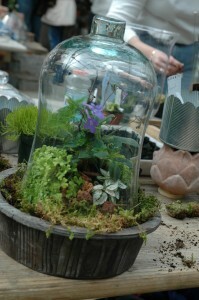 Everyone succeeds at a terrarium workshop. This is a rewarding make-and-take where you bring home your own small world. 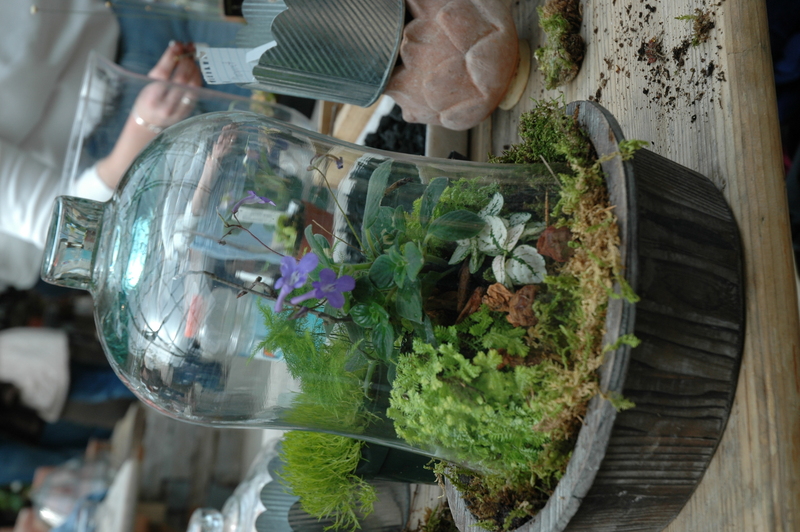 Or come to a lecture and see a terrarium-making demonstration so you can do the dirty work at home. March 5, 2011: CT Daylily Society ~ Avon, CT ~ Terrarium workshop, email tvcotter@comcast.net for more information. March 12, 2011: Northeast Floral Expo ~ Sturbridge, MA ~ Terrarium workshop, go to www.northeastfloralexpo.com for more information. March 22, 2011: Middlebury Garden Club ~ Middlebury, CT ~ Terrarium workshop. March 27, 2011: Lori Warner Studio ~ Chester, CT ~ Terrarium workshop ~ got to www.loriwarner.com for more information. May 22, 2011: Broken Arrow Nursery ~ Hamden, CT ~ Terrarium workshop ~ go to www.brokenarrownursery.com for more information. Sept 17, 2011: Spruce Home and Garden ~ New Milford, CT ~ Terrarium demonstration ~ go to www.sprucehomeandgarden.com for more information. October 2, 2011: Linden Hill Gardens ~ Ottsville, PA ~ Terrarium workshop ~ go to www.lindehillgardens.com for more information. February 6, 2012: Suffield Garden Club ~ Suffield, CT ~ Terrarium lecture and demonstration. Trust me, what you need is a terrarium. You might think that you need a vacation or a drink or a fast car. But really, all you need is a terrarium. 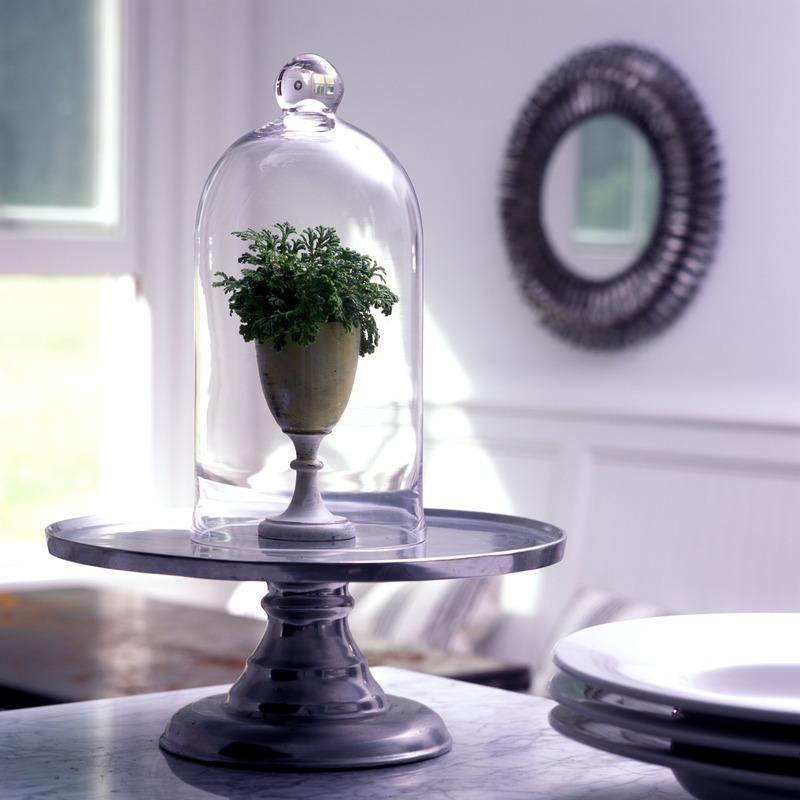 Not only will a terrarium give your creativity a sparkling outlet, but it will bring you peace. Beyond enabling you to grow plants and profile nature where you could never host horticulture before, a terrarium is fully capable of soaking up the frustrations in your world. Don’t believe me? Try one. How do I know so much about terrariums? I make them all the time. Seriously, my house is filled with terrariums. I have experience in this venue and plenty of it. I started making terrariums as a child and it became an obsession when I started growing houseplants bigtime. At any given moment, my home is filled with 20+ terrariums. I wrote the first terrarium book out there on the subject — The New Terrarium (Clarkson Potter, 2009) — and I give lectures and terrarium workshops throughout the country. I speak to groups ranging from garden clubs and school classrooms to seniors (check out my schedule for a talk or workshop near you on the most recent “Where I’m At” post). I see myself as a missionary of the gardening kind. Want to talk about a lecture or workshop? You can reach me at tovah@tovahmartin.com. 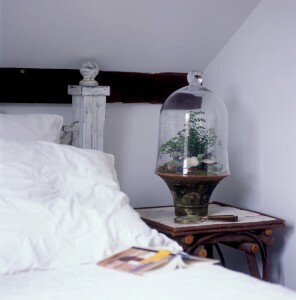 This blog is a spin off from www.plantswise.com. You wanted to hear more about terrariums. You begged for a forum to talk about gardening within glass. So here comes www.terrariumwise.com. Case closed.